Serving Suwanee GA, and the surrounding towns of Johns Creek, Buckhead, Canton, Acworth, Sandy Springs, and Burford, Chimney Solutions has been providing chimney sweep services to the area since 1998. Residents in Suwanee GA turn to us for all of their hearth & heating needs, including chimney cleanings, fireplace & insert installations, chimney crown repair, chimney damper installation, masonry work, and chimney restorations. Thousands of satisfied customers across the greater Atlanta area have helped us maintain our superb reputation as the chimney contractor of choice for Suwanee GA and the surrounding communities. When it comes to chimney maintenance and repair, the CSIA trained & certified chimney technicians of Chimney Solutions always complete the job to the highest of standards and with the best workmanship possible. Serving the area since 1998, local residents have come to expect quality work, fair prices, and courteous service. We receive excellent feedback from customers, and our dedication to top notch service has gained us a lot of word-of-mouth referrals stretching across the state of GA. Our trained professionals will always arrive on time, in a company uniform, and in a clearly marked company truck. Throughout Suwanee GA, up and down Buford Highway & Interstate 85, across McGinnis Ferry Rd, and Suwanee Buford Dam Rd, our company vehicles can be spotted as they travel on their way to service chimneys, fireplaces, and heating stoves across the area. From chimney relining services to chimney cap installations, chimney waterproofing, chimney rebuilding, and chimney inspections, our CSIA certified chimney sweeps stand behind every job completed. Residents have come to expect quick service, fair prices, and a thorough explanation of any recommended work. 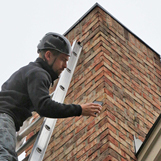 Our reputation precedes us, and thousands of satisfied customers have returned to us year after year for their annual chimney maintenance and repairs. As the area’s most reliable chimney contractors, it’s no wonder homeowners recommend us to their friends, family, and neighbors. We are current members of the National Chimney Sweep Guild and the Chimney Safety Institute of America. We remain on top of current industry standards, including best practices, new products, and service techniques. Don’t be scammed by “cheap sweeps”! These fake chimney sweep contractors are out to fool unsuspecting homeowners. By advertising prices that are too-good-to-be-true for common chimney sweep services like an inspection or cleaning, they entice homeowners to hire them for simple jobs. Not only do these companies lack the proper training & experience to service chimney systems, their main goal is not to provide just the service they were hired for. Instead, their intention is to scare the homeowner into thinking that extensive repairs are need in order to upsell the homeowner into expensive services. Since most homeowners do not know the current condition of their chimney system, they must take the contractor at their word, so these unscrupulous chimney sweeps use this to their advantage. Don’t agree to any extensive chimney services without getting a second opinion from a qualified contractor first. Don’t pay more than you have to and don’t let untrained chimney sweeps compromise the safety or functionality of your chimney & venting systems. 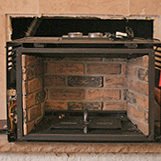 Keep the safe operation of your fireplace, heating stove, fireplace insert, chimney & venting systems a top priority. 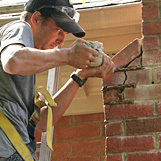 Trust in the pros at Chimney Solutions for any chimney related need. Suwanee GA chimney contractors provide top-notch chimney sweep services at a price that is fair and honest.